A classic among questions asked of biology students goes something like this, If I carve my initials into a tree trunk four feet off the ground, assuming the tree increases in height at the rate of one foot per year, where will those initials be in 10 years? First off, carving through the bark of any tree should be strongly discouraged as this will do harm by girdling or disrupting the continuity of conducting elements which lie immediately beneath the bark. The answer to the question however is, of course, that the initials will remain four feet off the ground. Trees grow up at branch tips as a result of apical growth. I believe we have all learned that they also grow out and I have spoken of the phenomenon of secondary or lateral growth before. It is lateral growth with which we concern ourselves when contemplating the nature of annual tree rings. Imagine a cross-section of a mature tree. Lateral growth occurs along a thin ring of tissue called the vascular cambium which surrounds this section close to its outer edge. Phloem is responsible for nutrient transport and accumulates to the outside of the cambium while xylem is responsible for water transport and accumulates to the inside of the cambium. 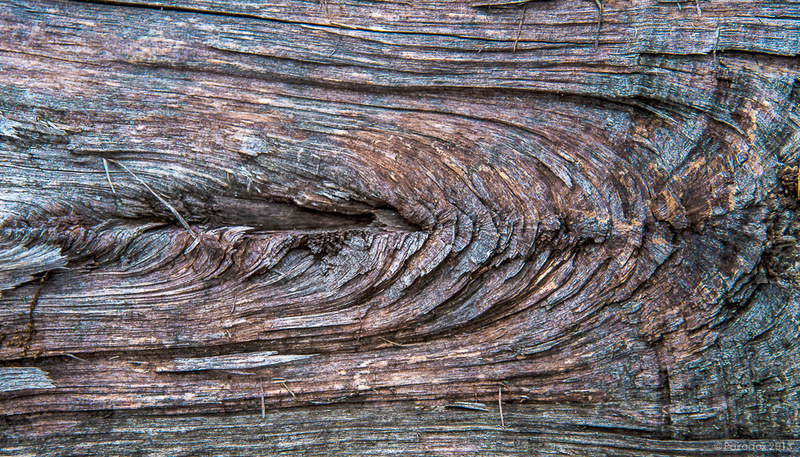 It is the xylem which comprises what we commonly refer to as wood. 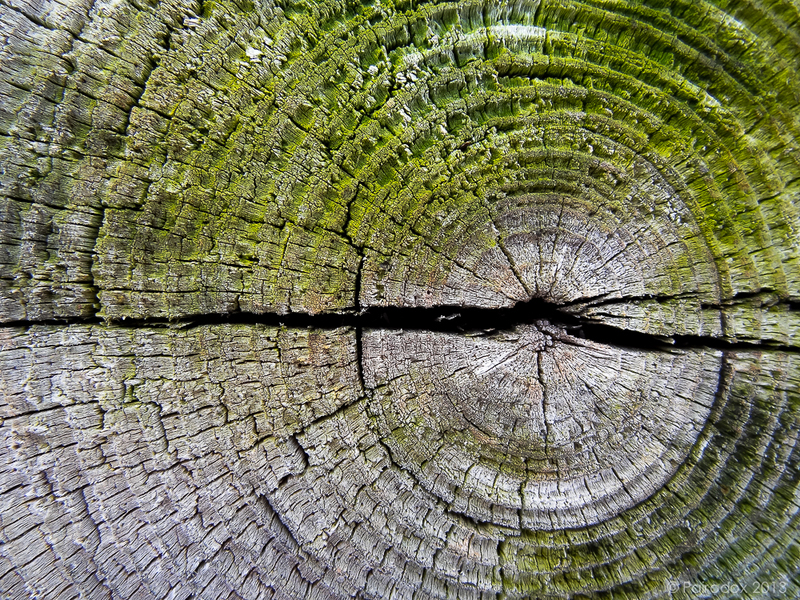 Rings of xylem include wide bands of rapidly growing spring wood and narrow bands of more slowly growing summer wood. Taken together each pair of rings represents an annual increment of growth. The images below show annual tree rings in what histologists would refer to as longitudinal (top photo) and cross-section. The image in cross-section shows the wide rings of spring wood and narrow rings of summer wood. You are looking at the exposed top of a fence post, dried with age, and with a vigorous algal colony clearly established. I like the image in longitudinal section for its dramatic and seemingly tortuous texture. It was taken just the other day on a recent walk in the woods. This large trunk gave way where it joined with its more massive partner and most of the twist and turns indicate the nature of the former union. I did not linger to determine what caused its separation. Perhaps its weight and angle of growth, relative to the remaining trunk, was such as could no longer be supported. The separation reveals a series of parallel lines which, in cross-section, would form concentric rings of annual growth. If you looked closely at either image and noticed that the size of the rings was not uniform you would be correct. Tree rings vary in thickness and they do so in direct proportion to the degree to which the tree grew during any particular year. A ring will be wider in a good year and narrower in a bad one. It is this understanding that allows a dendrochronologist to tell much about ancient climates, and some climate chronologies extend for many thousands of years.You may wonder how this can be so if the average tree lives for only several hundreds of years? The answer is simple and quite cleaver. One begins by establishing the ring pattern of a fairly young tree. Because all living trees in a given area will experience the same environmental ups and downs these vagaries will be recorded in much the same way in the annual rings across trees of all ages. So one plays a game of LeapFrog with the chronologies set down by trees whose lives overlapped in time. For example, let’s say that you are able to establish the ring pattern back 250 years for a particular living tree. You might find that the last 25 years of this chronology overlap with the first 25 years of an older sample (not necessarily an older tree) which you determine to be 175 years old. Together, the two samples have accounted for 400 years of tree-recorded history although the older of the two individuals is only 250 years. This sort of dendrochronological information can be combined with similar sorts of data which are taken from cores of ocean and lake sediments and corals and even ice to conduct paleoclimatological analyses which push our window of understanding of global climate back nearly 750,000 years. Care to see a tree ring data set which tells us what rainfall was like during the year the Pilgrims made it to Plymouth? If so just migrate to the website of the North American Drought Atlas and look it up. [The PDSI is the Palmer Drought Severity Index. Extreme drought conditions are to the left (red) while extremely moist conditions are to the right (blue).] If you look at the map here and at the very bottom you will see that the tree rings tell us that 1620 was a good year in Massachusetts being slightly wetter than average. Fascinating stuff.